"After Years in Prison, Now a Break "
In May 1994, Kareem Bellamy stood outside his home on Beach Channel Drive in Far Rockaway, Queens, drinking a beer. He was violating the “open container” law. A detective car pulled up. Mr. Bellamy was handcuffed. Kareem Bellamy was 26 when he was arrested for murder. Now he is 41, and his conviction has been vacated. If that was a guess, it was a good one. Six weeks earlier, a man named James Abbott had been stabbed to death outside a C-Town supermarket a few blocks away. What led detectives to Mr. Bellamy was a call from one of the supermarket cashiers. She said that a man who had been in the store with the victim just before the killing was, at that very moment, drinking a beer on Beach Channel Drive. No one ever said Mr. Bellamy had any motive for the killing, or any real connection with the victim beyond his supposed presence in the supermarket that day. The sole eyewitness to the stabbing was not able to identify him with much certainty. Even so, the words Mr. Bellamy uttered in the car effectively put him in prison, a judge ruled, because they showed a jury his “consciousness of guilt” and buttressed what was otherwise thin evidence. The jurors struggled with their deliberations for four days, then returned to court — every man and woman weeping — and pronounced Mr. Bellamy, then 26, guilty of murder. He was sentenced to 25 years to life. 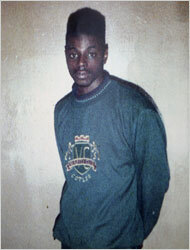 Many years ahead of schedule, Mr. Bellamy, now 41, is due back in court on Thursday, no longer guilty of the murder. His conviction was vacated on June 27 by Justice Joel L. Blumenfeld of State Supreme Court in Queens. Mr. Bellamy will be seeking bail while prosecutors decide whether to try him again. That Mr. Bellamy will have a second chance to fight the murder charge is due not to any particular diligence by law enforcement authorities, but rather because the final link in a chain of lucky breaks delivered him a secret tape recording. On it, a man says that he and another man actually did the killing. Over the last two decades, DNA tests have been a powerful force in setting right many wrongs, but they were not a factor in Mr. Bellamy’s case. In fact the vast majority of crimes do not involve biological evidence, so DNA tests are of no use. However Mr. Bellamy’s case turns out, the sequence of events that brings him back to court this week shows how many pieces must fall into place for most wrongly convicted people to get another meaningful day in court. Four years ago, Thomas Hoffman, a defense lawyer in Manhattan, got a letter pleading for help from Mr. Bellamy. He tossed it in the trash, thought better of it, then asked some of the city’s big law firms to help for no fee. Darin P. McAtee of Cravath, Swaine & Moore took on the case and hired private investigators. In January 2010, word spread around Far Rockaway that those investigators, a retired homicide detective, Edward Hensen, and a retired F.B.I. agent, Joseph O’Brien, were trying to scare up evidence that would reopen Mr. Bellamy’s case. As they canvassed a housing project, a man rode up on a bicycle. He knew Mr. Hensen from his years as a detective. He said he had to talk to them. Inside his home, he told the investigators that an old friend, Leon Melvin, had been upset that his girlfriend had become too cozy with Mr. Abbott. According to the informant, Mr. Melvin confided that he and another man had stabbed Mr. Abbott. In fact, those same two men had been implicated 14 years earlier by another person — a woman who called the detective bureau to give their names. At the trial, the detectives said they couldn’t find the woman. After the new informer surfaced this year, the private investigators wired him with a hidden tape recorder. On Feb. 2, the informer met with his jealous friend, and they spoke about a stabbing that took place somewhere near 40th Street in Far Rockaway. A partial transcript of the conversation was included in Judge Blumenfeld’s ruling. “You mean you told him to leave her alone, and he wouldn’t leave her alone,” the informer says. “Yeah, he wouldn’t listen to me, so I had to do what I had to do,” Mr. Melvin said. “So you stabbed him?” the informer asks. “How many times you stabbed him?” the informer asks. “Stabbed him about seven times or something like that,” Mr. Melvin said. Mr. Bellamy says that he was guilty only of drinking a beer. "The tough problems we solve right away. The impossible ones ... may take a little longer."